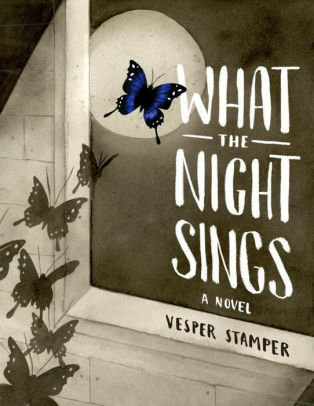 *What the Night Sings by Vesper Stamper. Knopf, 2018, 249 pages. On the day the British liberated the concentration camp at Bergen-Belsen, Gerta Rausch was too weak to walk; a soldier pulled her from the arms of her dead bunkmate and carried her out into the sunshine. There she very slowly realized she was still alive, among the piles of the dead. That thought is enough for days, weeks, even months. But slowly, as flaccid muscles firm up on her bones and strength returns, she realizes the script of her life has been torn to bits and she will have to write a new one. But she doesn’t even know where to start. Music was her life—her father’s viola, orchestra concerts, her stepmother’s celebrated koloratura soprano, Gerta’s own singing voice. There was nothing else; she didn’t even know her Jewish heritage. Since Kristallnacht, when her mother was killed, her farther had tried to keep their identity secret. But eventually they were betrayed, and Gerta and her father packed in cattle cars with his precious viola. He didn’t last long, but she managed to survive almost two years by playing in the camp orchestra, particularly when new arrivals were being herded off to the rail cars. But now, barely sixteen, her voice is gone, and all her family. The author (whose script was also torn up by a traumatic event), devotes most of the narrative, not to the horrors of the Holocaust, but to the three years after liberation when the survivors were putting themselves together again. Bergen-Belsen becomes a refugee center, with flowers, gardens, bakeries, and music. And even love. Gerta’s journey from false security to unmaking to recovery and finally to faith takes a few false turns but ends in a place she never expected, firmly rooted to life. The narrative ends with Psalm 126: When the LORD restored the fortunes of Zion, we were like those who dream . . .
“. . . . [T]here is an essence of who we are that runs deeper than what we do or what we imagine ourselves to be. When all is stripped away, who am I?” Not self-sufficient units, but people who freely choose to enter into relationships with each other, and thereby discover who they truly are. Poplar trees, a recurring theme in the illustrations, suggest rootedness, permanence, and persistent life in spite of all the tragedies of history. The layered ink illustration, richly symbolic, blends with the moving text to make more than a story. It’s an experience. Please note: though the reading level is early teen, the novel is better suited for 15-up. What the Night Sings was a runner-up for the William C. Morris award for a debut YA novel, a runner-up up for Asian/Pacific Award for Literature, and the winner of the Sidney Taylor Book Award for excellence in portraying the Jewish experience (teen division)–all awards given by the ALA.
Our asterisk (*) indicates a starred review.